I gave myself two weeks to complete this project. The deadline was my own vacations. I'm glad to tell you I reach this step in a week. At a rate of 8 to 12 hours per day, it moved at a steady pace. 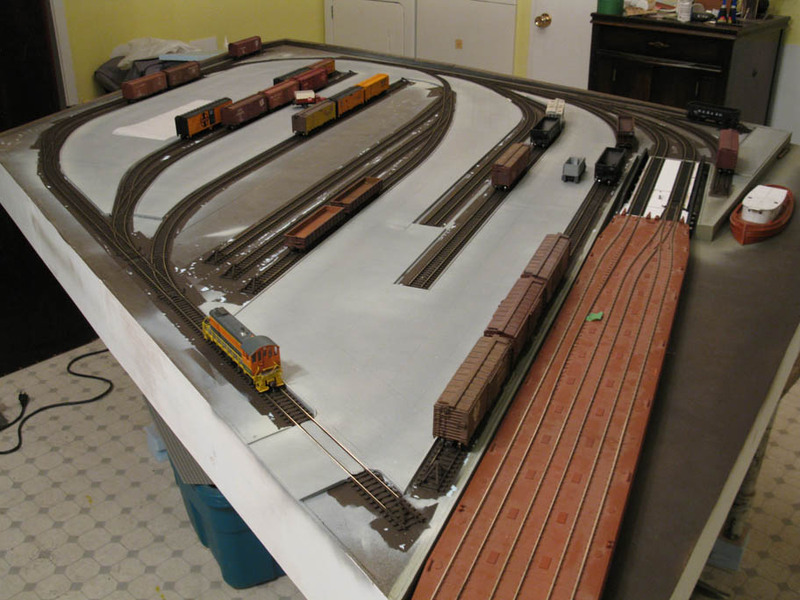 I consider I have now completed all the messy basic stuff including painting track and roads in basic colors. To me, this is a true achievement. 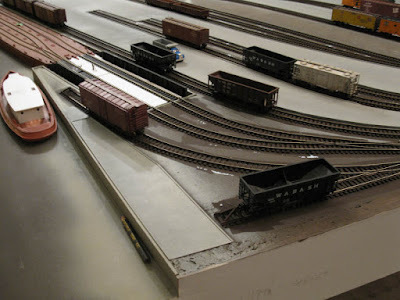 Thought I started to build many layouts in my life - probably over 20 - this is the second time I reach that point where only building structures, scenery and detail cars remain. 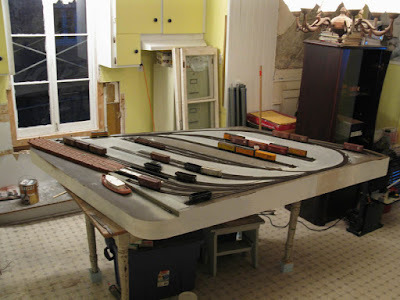 The first time was when I was 7 years old and I built my first 4' x 4' train layout with my father, sister and brother. 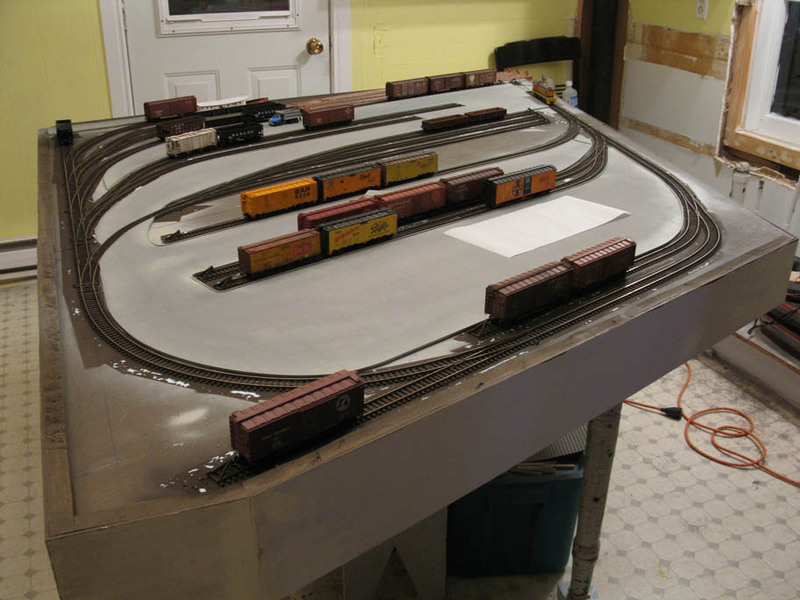 Good to be back on track after a 25 years hiatus! Seriously, never reaching some level of achievement can be quite distressing at some point. I've learned a few things bout myself while doing this project. I didn't over design the project, but took a decent amount of time to plan carefully the project. When I started to rip wood, I knew there was no turning point and decided to address issues as they appeared. I didn't let small things stop the project and thought about alternate way to get the job done in due time. I was ready to sacrifice my obsession for perfection which had always been my most major pitfall. Funnily, I can't say I cut corners on quality as the final product is quite good. Finally, I didn't set a real schedule but each time I started a job, I made a point I would complete it on the same day if possible. That was particularly important to get over boring or painstaking work. So, what has been achieved today? Well, all the roads were painted. I became lazy and decided to give a try at Lance Mindheim spray can technic using grey primer. I didn't try to get a solid color but instead tried to keep some transparencies here and there to get color variation. The cardboard I used had a very nice color from the start. 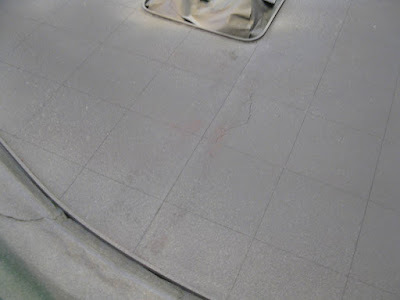 With what remained of my last can of Krylon Satin River Rock, I highlighted the concrete curbs and some other spots. It was merely a mist but it did improve the general look. Next, I spray a good coat of Dullcote before airbrushing a mix of India ink and isopropyl alcohol to give some wear and depth. 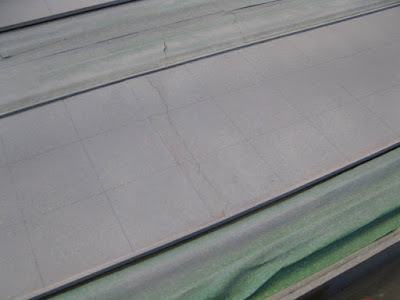 When dry, I draw the concrete slab lines with a black color pencil. It may sound childish, but it really gave a lot of details with too much effort. 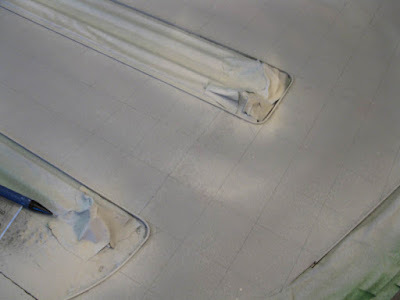 It was also a good way to hide the unsightly real seams in my roads. Concrete slabs follow a rough 12 feet x 12 feet grid. I followed U.S. Highway practices from the 20s and 30s. 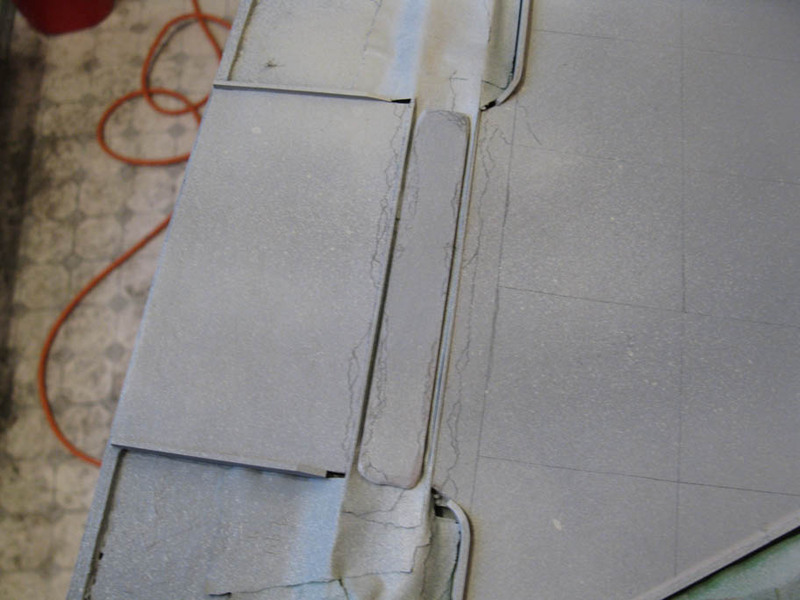 Finally, the last step was to add cracks here and there to represent old concrete slabs. I particularly detailed the grade crossing where a lot of stress is exerted by trucks and trains. 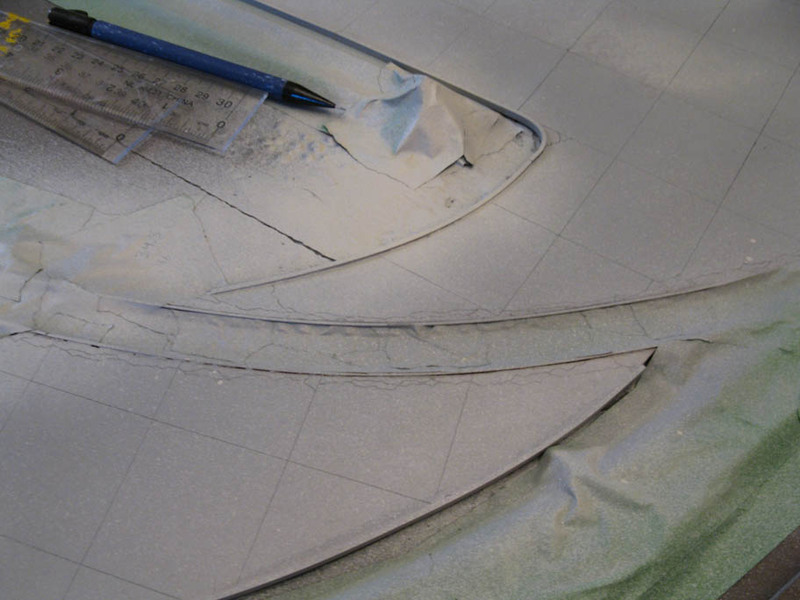 The most rewarding moment was when all the masking tape was removed and american cars were added to the scene. We can already have a good idea of the final product. Better, some scenes are instantly recognizable from old prototype pictures of Harlem Station. Oh, I didn't remember I had so much old U.S. cars. 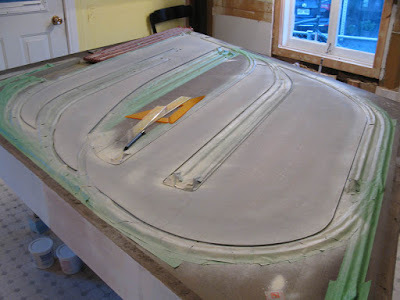 Lots of fun detailing projects in sight! 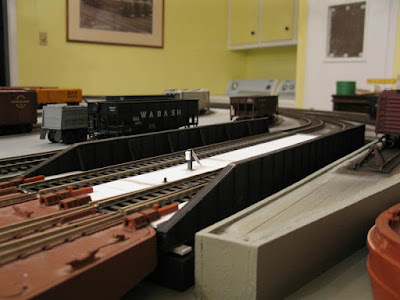 The most urgent matter is to build a battery powered locomotives and operate the layout! 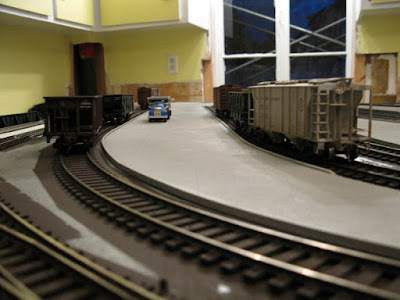 And now a few railfan shots! Looking sharp, Matthieu! 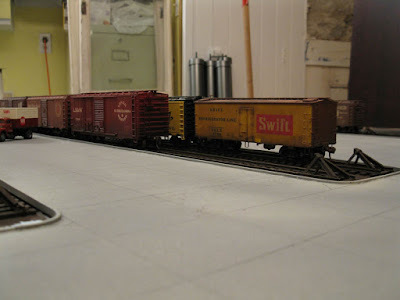 The cardboard seems to work really well, and I like the styrene curbs. I'll have to dig up a photo that shows that side fence. There seemed to be some grade difference and a rock wall if I remember correctly, so I"m curious how it was accessible down by the water. Did it slope? I've also noticed that your lead on the back side is longer than mine started out. I could only fit one locomotive and one car in it, which meant I couldn't use a trailing battery car, so I'm having to lengthen it. Did you do it because of that, or is that the actual length you determined from research? According to a picture taken from Harlem River opposite side (or from a boat), the concrete pad nead the river did slope quite a lot over a short distance to reach the service road next to 149th Street. I found it after I built the fascia, so mine doesn't slope enough. The wall was concrete and about 4 to 5 feet high. It extended along Exterior Street too. I have a few good pictures of the wall, but all pictures of the fence gates are quite blurry. The lead lenght was determined per prototype. 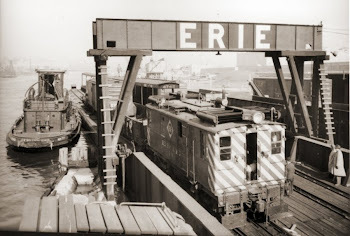 The 50s aerial photograph and maps show it was long enough to handle a locomotive + two cars. In HO, it is about 20 inches long. I think it makes sense. It would be enough to have the battery car. I just got my boxcab shells today. I'm thinking about using AirWire system. 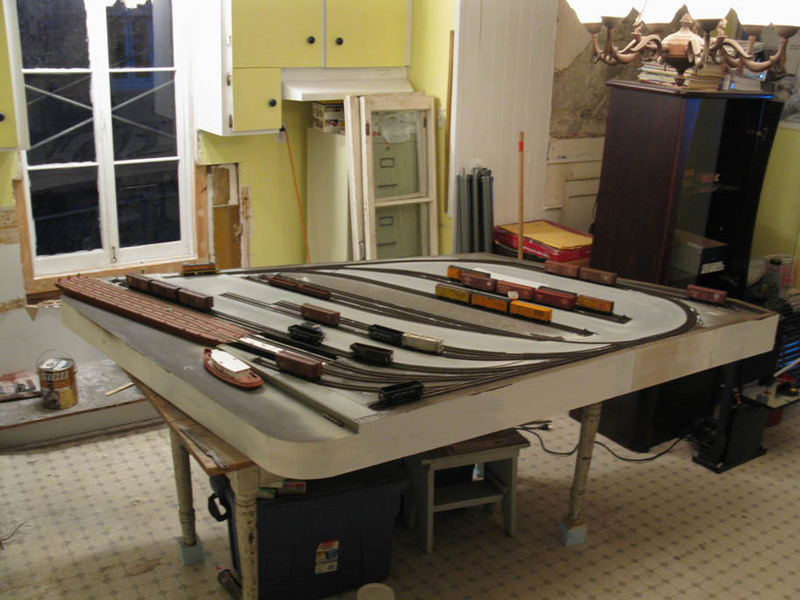 It will be powered with a Bachmann GE 44-ton motorization (the most recent version). I know you use that model a lot with battery. What would you recommend for a 1.5 hours operating session? My guess was that a 500mAh battery should be enough. I'll try to fit a 500mAh in the cab then. It should work.